Genres of the books featured range from fiction to celebrity biographies, business, medical, memoirs, nutrition/cooking, sports, true crime, freelance writing, and more! From a "pitch sheet" distributed by an author at a writer's conference, to a professional "manuscript evaluation" by a ghostwriter, to full-blown book proposals that look like books in themselves, you’ll find it all right here - everything you need to write and/or polish your own book proposal to perfection! "I've been reading through your book. I'm going to recommend it everywhere I can. There's nothing on the market like this. Also, the book -- physically -- looks fantastic. Congratulations." In Angela’s work, Book Proposals That Work, I have found a wealth of information, guidance and direction only a true friend and master of the craft can provide. I am engaged in a work that may very well change the course of my career because of this book she has complied. I want to thank Angela Hoy for her endearing fortitude and unwavering commitment to the craft. And I want to encourage all of you to read Angela. She is formidable if not the best I’ve ever had the privilege of knowing. Angela Hoy is the publisher of WritersWeekly.com and co-owner of BookLocker.com. WritersWeekly.com is a free online publication that features new freelance jobs and paying markets every Wednesday via email, as well as feature articles, freelance success stories, warnings about naughty publishers and editors, and more. BookLocker.com is a print-on-demand (POD) and e-book publisher that pays high royalties while offering low setup fees. Angela evaluates all incoming proposals and manuscripts and must, unfortunately, reject the vast majority of them. 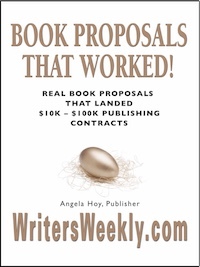 After seeing so many poorly-written and disorganized book proposals, she decided to create this guide for authors.